Police used tear gas and water cannons to disperse protesters opposite the Indian Consulate Office in Hambantota. 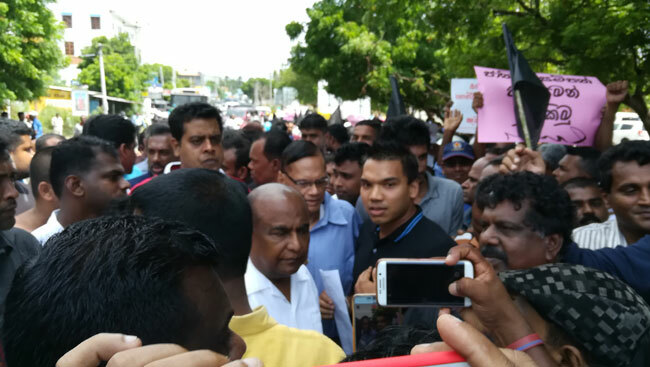 The protest was organized by members of the ‘Joint Opposition’ including MP Namal Rajapaksa, against the agreement to handover operations of the Hambantota port and Mattala airport to two foreign companies. The protest was scheduled to be held near the Mattala Airport today, however the venue was changed to Indian consulate in Hambanota after police had obtained a court order preventing any protests being held near the airport. The protesters accuse the government of attempting to sell state assets to foreign countries. The Hambantota port is to be operated by a Chinese company while Mattala Airport will be operated by an Indian company.